The objective of this book is two - fold: to acquaint the visitor with the history, culture, long tradition, lores and the beauty of this captivating land called "Hellas / Greece", on the other hand, to provide relevant information in order to make this tour as exciting, exhilarating, enjoyable and as worry-free as possible. 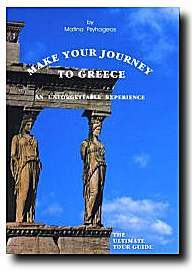 It has been designed to accommodate by presenting facts and recommendations necessary to anyone visiting a foreign country (i.e., a summary of Greece's long history, everything needed to communicate in the native tongue and all that is required for a wonderful, indeed unforgettable journey). Bon voyage! ...Do not miss (if you have the chance) a performance at the Odeon of Herod Atticus in Athens. It is an experience to be treasured. Imagine this: you're listening to a modern/classical symphony or watching an ancient tragedy, performed - in a 2500 year old amphitheater-by first-class actors, while you're looking-up towards the Monument of Monuments the Parthenon and the marvel of the Acropolis. That is indeed one of the most up-lifting lifetime adventures.